Healthy habits may not be as healthy as you think. Do you ever get the feeling you’re doing everything “right” for your health and still getting nowhere? Yeah, I know exactly how you feel. I’ve felt that way dozens of times during the last few years since I began my health journey. And it is sooooo frustrating! But even more frustrating is the idea that if something isn’t working for you, then you must not be doing it enough. If drinking eight glasses of water a day isn’t fixing your problems, then drink ten. If running a mile in the morning isn’t helping, then run four miles. And if being on a low-carb diet isn’t working for you, then you must need a zero-carb diet. This stems from the more-must-be-better philosophy which, by the way, I totally disagree with. Whether or not more of anything is better depends on a lot of factors, which should all be centered around the individual–aka you. When I started paying attention to my body’s response instead of just blindly following some guru or another, I was amazed at how quickly I was able to uncover so-called “healthy” behaviors that were working against me. 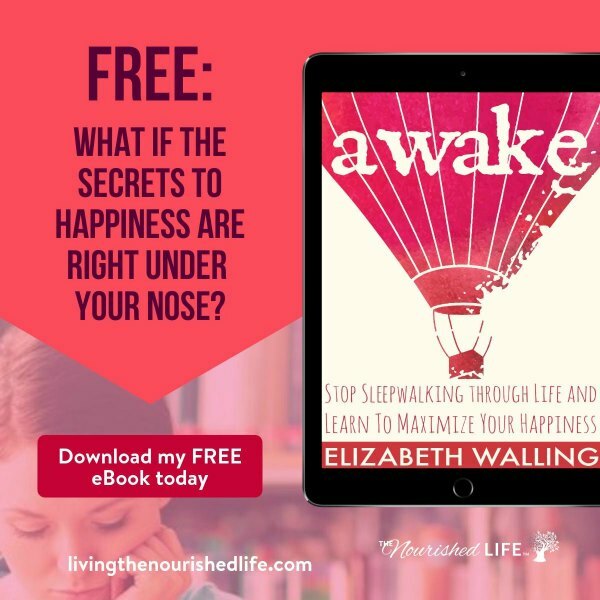 I was surprised to discover just how much advice I was following out of habit–sometimes habits that stemmed from tidbits I picked up from who-knows-where when I was just a kid! So, what determines if something is a healthy habit or not? Your body and your metabolism! A truly healthy habit will nourish your metabolism and ultimately evoke a positive response from your body. And if a habit is not doing those things for you, then maybe it’s not so “healthy” for you after all. What Does it Mean to Nourish Your Metabolism? 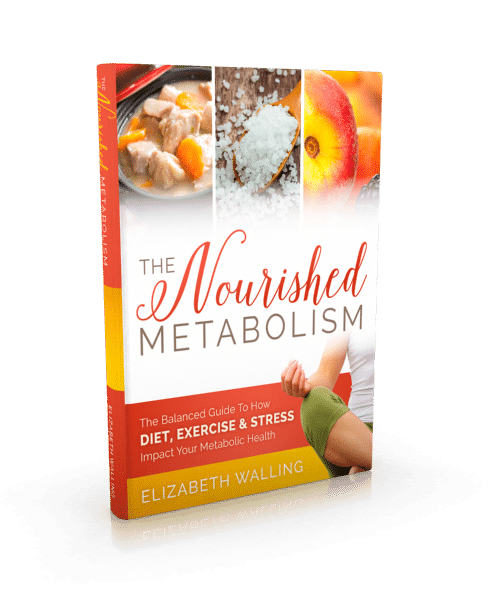 Before I get into which “healthy” habits may not be so healthy, I want to explain my idea of nourishing your metabolism vs. stressing your metabolism, a key premise in my book The Nourished Metabolism. Your metabolic health is the sum of all your body’s amazing functions–how your cells use energy, how well your digestion works, the quality of your sleep, your energy levels, your moods, and much more. Stress hormones like adrenaline and cortisol throw a wrench into all of these functions and cause imbalances that stress your metabolism. 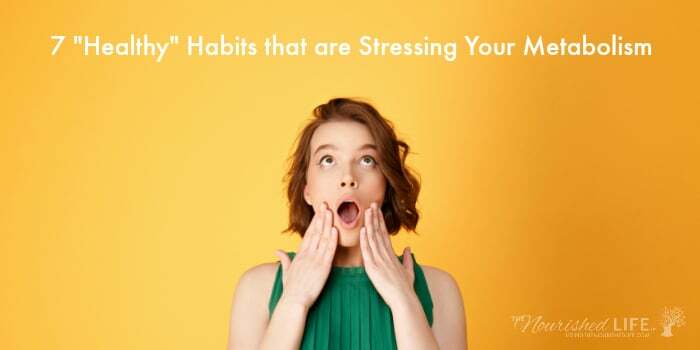 Because chronically high stress hormones interfere with healthy metabolic function, one of the key principles for nourishing your metabolism is to work on normalizing these stress hormone levels by reducing your overall stress load. Identifying and eliminating (or at least reducing) some of these stressors is an important step to nourish your metabolism. With this in mind, it’s easy to see why some “healthy” habits are actually stressing your metabolism by promoting high stress hormone levels, and in the end, doing more harm than good. Which healthy habits are hurting your metabolism? 1. Following a diet plan. Everyone knows that following a diet plan is way healthier, right? Wrong! Diet plans break two important rules for nourishing your metabolism: 1) they often deny your body energy by restricting food intake, and 2) they tell you to listen to the plan instead of your body. Diet plans try to make you fit into the plan, instead of allowing you to make a plan that fits you. Diet plans tell you what to eat, how to eat, when to eat, and especially what NOT to eat. Diet plans are always centered around restricting–whether it’s fat, carbs, animal foods, starch, or just calories in general. The restriction mentality is stressful and almost always backfires. Restriction tells you that your body only wants the “wrong” things, so you have to listen to a plan instead of listening to your body. This is just not true! Once you’ve taken a step back from the restriction mentality, what your body really wants starts to become a lot clearer. But you have to be willing to step outside of the “plan” first. Listening to your body is a truly healthy habit. 2. Eating lots of fiber. Yes, I know that fiber is the darling of the health industry. We’re told that fiber is like little brooms that “sweep” away all the icky stuff hanging around in our digestive tract. It’s a nice analogy, but it isn’t the whole story. Fiber is packaged with phytic acid and oxalates, both of which can prevent the absorption of important minerals like magnesium, calcium and zinc. Fiber also hangs around your gut and feeds the bacteria there–and not just the good kind. If you already have an imbalance of pathogenic gut flora, fiber can literally feed the problem and just make it worse. So if you already tend to have digestive issues, eating a lot of fiber (and especially forcing a bunch of fiber supplements down your throat) may not be such a good idea. Now, fiber’s not all bad–it can also help beneficial bacteria produce healing short-chain fatty acids like butyric acid. Often fiber’s negative side effects are dose-dependent, so most people don’t need to worry about completely eliminating fiber from their diet. I’m not advocating extremes, trust me, but just keep an eye on how your body reacts to fibrous foods–you may benefit from cutting back on your fiber intake. 3. Drinking 8 glasses of water every day. Let me start with this: hydration is important! So don’t take it the wrong way when I ask, is it possible you’re drinking too much water? The idea of drinking too much water sounds completely ridiculous in our culture which encourages downing a bottle of water every chance you get. Did you wake up? Drink a bottle of water! Hungry? Drink a bottle of water! Thirsty? Holy cow, you’re already dehydrated–drink two bottles of water! Again, keeping your body properly hydrated is a healthy practice, but drinking X amount of water every day just to fill a quota isn’t the healthy approach to hydration. Your metabolic rate. A low metabolism requires less fluid, and a high metabolism requires more. Your activity level. A heavy exerciser will need more water. If you aren’t very active, you may need less. Your climate. A dry, hot climate will increase your water needs, but if you’re in a cool, humid climate, you may need less water. Your body prefers a healthy balance of minerals, sodium and water–and plain water contains just one of those important ingredients. If you detest the taste of plain water, it might mean your body wants a more balanced form of hydration. Try some diluted orange juice with a dash or two of sea salt. This balanced beverage can quench your thirst while also supplying you with electrolytes like sodium, magnesium and potassium. Now that’s a healthy habit. 4. Eating chicken breasts for protein. Getting plenty of protein is definitely a healthy habit for nourishing your body, but in today’s culture that tends to mean eating a lot of muscle meats like chicken breasts. Muscle meats are fine and dandy (if they from quality sources like truly free-range chickens or grass-fed cows), but they don’t contain the best balance of amino acids. Traditionally, meat consumption was always balanced with gelatin (or collagen) in the form of rich bone broths made into soups, sauces, gravies or stews. But today we’ve strayed from this practice and tend to just consume to meat by itself (or with processed broth that contains a lot of yucky additives and virtually no gelatin). Gelatin contains important anti-stress amino acids like glycine, which has been shown to improve insulin function, protect your liver, and is anti-inflammatory. You can balance your overall protein intake by eating more gelatin-rich bone broth or by supplementing with high quality collagen protein powder. For further reading on protein: Daily Recommended Protein: How Many Grams Do Your Really Need Per Day? 5. Restricting your salt intake. Salt naturally increases your metabolic rate. Low-salt diets are linked to a higher mortality rate. Low-salt diets increase insulin resistance. The key to getting the right amount of salt–not too little and not too much–is to listen to your body! Salt simply tastes better when your body needs more sodium (just like plain water tastes good when you’re really thirsty!). Just be sure to choose a quality salt with no additives, and then simply salt your food to taste. Sometimes you’ll want more, sometimes you’ll prefer less, and that’s totally fine. 6. Eating tons of raw veggies. Over the years, I’ve eaten many a salad in the name of establishing healthy habits, but I can count on one hand the times I actually enjoyed eating a salad (and in those cases, usually some bacon or cheese was involved). As it turns out, maybe my body was trying to tell me something: raw veggies aren’t your best friend. Raw vegetables are loaded with cellulose, a fiber that the human body simply can’t digest. Certain animals were definitely designed to eat a cellulose heavy diet, like cows with their multiple stomachs, or horses with their large cecum. But we humans are blessed with one stomach and a small cecum. We’re just not made to digest cellulose. And indigestible material can often lead to irritation and inflammation in your gut, especially for sensitive individuals. But the trouble with raw veggies doesn’t stop at cellulose. Raw vegetables also contain anti-nutrients like oxalates (which block calcium absorption) and goitrogens (which suppress thyroid function). Luckily, simply cooking your veggies can break down cellulose, neutralize oxalates, and at least partially neutralize goitrogens. So you can still eat your veggies if you want–just eat them cooked (at least most of the time). 7. Focusing on cardio and aerobics for exercise. Our society tends to put a lot of focus on running marathons, logging in hours on the elliptical machine, or going to spin class. Cardio exercise just seems to be so politically correct, you know? But politically correct doesn’t always translate to metabolically beneficial. Being active is definitely an important part of being healthy, but I think there is a smart way to be active without sacrificing your metabolic health. Cardio exercise triggers the release of stress hormones, so it can definitely be overdone. This is especially true if you already have a problem with high stress hormones–doing a ton of cardio is only going to make the problem worse. Put more focus on muscle-building exercise. This can be weight lifting, body-weight strength training, yoga or any other muscle-building activity. This type of exercise is linked to metabolic benefits like better insulin sensitivity, improved brain function, stronger bones, and better moods. Turn cardio into HIIT. High intensity interval training (HIIT) can usually accomplish the fitness gains of cardio exercise in a fraction of the time. HIIT sessions don’t typically reach the “endurance” phase when the body starts releasing a lot of stress hormones into your system, plus it’s associated with improved heart health and insulin sensitivity (it’s even been shown to support fat loss more than cardio exercise!). Fuel your exercise with the right diet and lifestyle. It’s important to remember to support your active lifestyle with plenty of quality food and good sleep. A poor diet (especially not eating enough) and poor sleep habits can cause chronically high stress hormones–add a bunch of exercise to the mix and you’ve got the recipe for a metabolic disaster. So be sure your getting the food and sleep you need to fuel your activity level. I’ve always felt it’s important to learn how to nourish your body, but in my own research, I’ve learned the term “healthy” can be relative. In the end, whatever advice you want to follow should always be tempered with a good dose of listening to your body. Your body is a complex system that is actually pretty smart, so always tune in to your biofeedback to figure out what’s truly healthy for you. Tell me about your health habits in the comments! Listen to your body. Nourish your metabolism. Tired of spinning your wheels trying to get healthy? Forget the extreme approach and try the balanced approach to forming healthy habits that nourish your body instead. I wrote The Nourished Metabolism because I spent too many years confused by all the different gurus, hopping from bandwagon to bandwagon trying to find the “right” way, instead of just listening to my intuition and my body. If you’re looking for a simple, common-sense approach to healing your metabolism, I really think you’ll enjoy this book. Like this post on healthy habits? Pin it below! Elizabeth is the founder and creative director at The Nourished Life. Her mission is to help people find a more balanced (less stressful!) approach to living a happy, healthy life.